Real-world strategies for achieving change: Change is one of the most important issues business has to face. Yet change initiatives – whether large or small, global or local – frequently end in failure. Too often relying on expensive external consultants, business has failed to develop its own people to initiate, support and drive through ongoing change. Based on real-life experience rather than theory, practicalities not prescriptions, this ground-breaking book helps you to understand change and develop the skills and strategies to make it a reality in your own organisation. 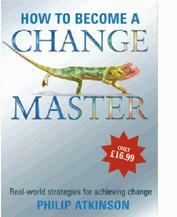 If you need to make change work in your organisation this book is a must-read. Here is a text that confronts, in a straightforward and practical way, the main challenges facing organizational change, and agents of change. As Philip observes, change has become 'business as usual', which means that mastery of continual adaptive reorganization is a critical corporate and individual capability. This book is unique in its emphasis on internal change agents. The change agenda for most organizations has become so urgent and widespread that staff at all levels can now find themselves responsible for facilitating, supporting, and driving initiatives. The skills of external and internal change agents are similar. Developing this theme in a novel and helpful manner, Philip considers the consultant-client relationships that internal staff also have to manage if they are to be effective. Issues of power, politics, conflict, and emotional response are inescapable aspects of change. But these topics are often missing from practical 'recipe books', and tend to be addressed in a heavily theoretical way in academic accounts. Here, the significance of behind-the-scenes interpersonal, influencing, and negotiating tactics are clearly explained, alongside the more conventional, and some unconventional, diagnostic and planning tools. Philip has an engaging writing style that uses clear summaries and illustrative cases from personal experience to highlight and reinforce key themes. There is no rigid formula to follow, and a flexible approach is recommended, addressing the unique conditions facing each organization. Where many treatments regard change as a process that ends with implementation, Philip considers the factors that can affect longer-term sustainability. The saying, 'if it can go wrong, it will', may be a joke, but is often a dominant feature of major organizational change. Philip thus advocates a preventative approach, noting that many of the problems that are likely to arise in change can be anticipated - and dealt with.